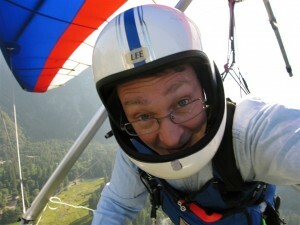 Paul Dees had his first soaring flight in a hang glider in 1984 on the California coast, ten years after his first attempt to fly a homebuilt bamboo hang glider. He was a basic instructor at Kitty Hawk Kites prior to earning his MS in Aeronautical Engineering. It was a challenge leaving the Outer Banks to start graduate school, but this did pay off. For Dees, the hang gliding experience, that was the most fun, was engineering, building, and safely flying an authentic replica of the Chanute-Herring biplane glider which originally flew in 1896. The replica is now on display at the Museum of Flight in Seattle. By trade, he is an aeronautical engineer developing new commercial airplane designs for Boeing. Dees has worked on 17 airplane design teams over almost three decades and three companies; has served as an aerodynamics test engineer, and is currently an airplane configuration designer. He is also an inventor and holder of numerous patents related to the designs of the Boeing 737, Sonic Cruiser and 787. He has also published many articles and technical papers on topics including hang gliding history, airfoil design, winglet design, the Wright gliders, and the design and performance of hang gliders. Dee’s wife, Kay, has been very supportive and understanding of his love of aviation. “Engineering Wright Gliders” will discuss the Wright brothers gliders and their estimated drag and performance, including the breakthrough 1911 glider that established the first official soaring duration record a century ago.